Canada’s infrastructure is failing and Canadians need to re-think the future. The problem with modern approaches to infrastructure is the constant need for maintenance, renovation and replacement. It could be that the RFP, lowest bidder process and lack of true building material knowledge is to blame. The current short term solutions approach taken to long term assets is expensive, environmentally costly- a better way can taken. The basis for modern life is concrete. Modern concrete is made from Portland Cement recipe and it has a usable outdoor life of 20 years. When the time comes to demolish these unsound structures, the dust generated contributes to air pollution. Also problematic is the manufacturing process. Portland Cement is responsible for 5% to 7% of the man made CO2 gas worldwide. The emissions are so high because of the heat (1,500C) needed to make to make the curing mineral, Alite harden quickly. The romans were the big historical users of cement and they were experts. 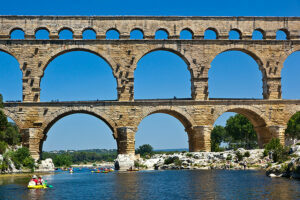 Much of the roman concrete in marinas and aqueducts survive today. The Pantheon has been standing for 1889 years. It is still the world’s largest unreinforced concrete dome. Roman concrete can last over 2000 years. But how it gets its durability has just been discovered recently. Roman concrete varies from the Portland Recipe by using 10% less water, less lime and adds volcanic ash. The ash is unique as it changes the structure of the cement to make it harder and more durable than modern cement. Even underwater, roman marine concrete remains unscathed by harsh salt water and currents. The secret they believe is in the ash. This ash contains Aluminum Silicate, when mixed with water, it causes a chemical reaction. The lime makes the cement denser and crystalline. There are still roman bridges with little wear after 2000 years. 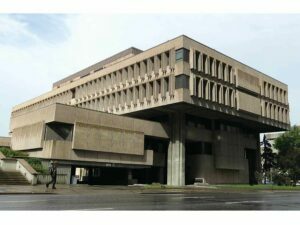 In Roman times, bare concrete was unpleasing. The majority of buildings and bridges were faced with brick or other stones. Alberta has a potential substitute, coal fly ash and the province generates tons of it. This is because Alberta derives the majority of its electricity from coal. The by-product of burning coal is fly ash. According to the ash recycling association, CIRCA up to 80% of Canadian fly ash is just landfilled and not used. Proponents like Headwater Resources of Utah think using fly ash for cement is the way of the future. They claim less heat is needed to produce, less water to mix and has a large savings over traditional cement. Durability, permeability & strength is greatly enhanced with this fly ash cement. So why isn’t this being used more widely? Big cement companies like Lafarge have researched it and can offer it, but why are municipalities not biting? Granted this is pretty obscure and recent technology, municipalities tend to move pretty slow. But cheaper, minuscule environmental footprint, and lasts 2000 years. Makes the cost of ownership, incredibly attractive. If the trend is to create greener cities, with a smaller environmental footprint. Then this product would make an significant positive impact towards that goal. The province would save billions on the longevity factor alone. They could even save lives. Are cement and construction companies not promoting this because it is too good? Regardless of motives, innovation marches on and waits for no one. Coal, used this way is a natural hedge against a potential cap n’ trade program. The heaviest polluters under that system are cement manufacturers. They could offset those debts with credits by producing roman style cement. Buildings and infrastructure built with this cement could gain extra credits. Allotments under LEED and other “green” building programs could also be used. Given today’s tape, plastic wrap, Styrofoam and plywood method of construction, maybe even mortgages could be lengthened given the superiority and longevity of the buildings built with Roman Cement. With such a potential for savings, Alberta and it municipalities must study this. They cannot wait for manufacturers, the infrastructure is aging and it needs a better solution. If municipalities can get off the buy, repair, redo treadmill, infrastructure issues of this nature can eliminated and capital focused elsewhere. Ideally turning the “sin” of burning coal into a saint of the environment and winning economically would be first choice. But if the Alberta fly ash is not favorable, then trial importation programs sourcing real volcanic ash should be investigated. Even doubling the lifespan of current cement is enormous. This alone halves the environmental footprint at a fraction of the current cost. That’s something taxpayers can get behind. This material is contains information from publications prepared by the Trebuchet Capital Partners and is not intended to be relied upon as a forecast, research or investment advice, and is not a recommendation, offer or solicitation to buy or sell any securities or to adopt any investment strategy. The opinions expressed are as of November 2015 and may change as subsequent conditions vary. The information and opinions contained in this post are derived from proprietary and nonproprietary sources deemed by Trebuchet to be reliable, are not necessarily all-inclusive and are not guaranteed as to accuracy. As such, no warranty of accuracy or reliability is given and no responsibility arising in any other way for errors and omissions (including responsibility to any person by reason of negligence) is accepted by Trebuchet, its officers, employees or agents. This post may contain “forward-looking” information that is not purely historical in nature. Such information may include, among other things, projections and forecasts. There is no guarantee that any forecasts made will come to pass. Reliance upon information in this post is at the sole discretion of the reader.